When you're a designer, every inch of space matters. Not every artist will have a canvas the size of the Sistine Chapel to work on, but as the rule goes: the bigger the better. For that reason, LG is pitching its range of UltraWide 21:9 monitors at seriously talented professionals who need every last pixel to work with. One of those professionals is Devin Graham, best known by his YouTube channel devinsupertramp. The master of the extreme sports video, Graham and his adventures have clocked up more than 765 million views with more than 4 million subscribers eagerly waiting to watch his next slickly-produced feature. 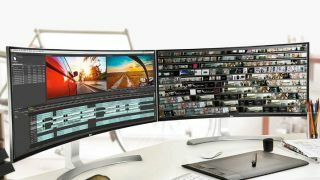 The videographer, editor and producer is accustomed to sounding out the best tech for the job, whether it's using a Glidecam to shoot super-smooth shots or, in the case of editing footage, an LG UltraWide 21:9 monitor. Featuring the same "cinematic" aspect ratio that you see at the movies, models found in LG's premium range are more spacious, immersive and geared toward Graham's professional needs compared to those that use traditional aspect ratios. "For years, we've filmed everything at 16:9," Graham says. "Now, the camera technology is there, so we can shoot at 21:9. That's huge for us; now we can make it look like it was an actual movie." By editing and watching back creations in the same aspect ratio as their intended audience, Graham and the Super Tramp team can both shape a video's visual impact while ensuring it has the desired effect in terms of storytelling. "For us, it's all about figuring out what stories are going to connect with people," says Graham. "I always ask myself, 'Is this something that I would want to watch?' I feel that's what makes the best ideas, the things that connect with us when we were children." It's a niche and original approach, and one that requires dedication and time. And one of the best ways to speed up the editing process when returning from a shoot with recorded footage is by making the leap from 16:9 to 21:9. Two or more 16:9 monitors can usually be replaced by a single ultra-wide offering, removing distracting bezels that invaded the central working area. There's no need to drag application windows from one screen to another, and there's enough space on the desktop to ensure that zooming in while editing footage is a thing of the past. According to Graham, the whole video process from start to finish has been sped up by making the switch. For a team that's produced more than 200 videos in five years, it's been worth the upgrade alone. "We're editing on those monitors," Graham says. "We're doing sound design on those monitors. We're color correcting on those monitors. Everything we're doing within the post-production, it all happens in the exact same place because we have to work so efficiently. "It just makes things so much easier and so much faster, because the technology is getting so much better." Using an UltraWide monitor has given Graham a less obvious advantage: swiftly responding to fan email. A firm believer in giving something back to his audience, the stuntman creates behind-the-scenes and tutorial videos to help fans learn the tracks of the trade. "Whatever we can do to help, we do…because seeing that passion inspires us to keep doing what we're doing."